JENN: So, just saying: the WDW Marathon is still only 72% sold. No pressure! Merely stating a fact, in case anyone is interested. MOON: Ha, point taken! If I were definitely training for a marathon right now then I would be failing miserably... This week I went for... ONE run? It's been very busy! Too many graduations, parties, first-world problems. JENN: Hey, one run is better than no run! 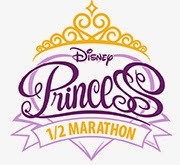 Registration for the Princess Half doesn't open for a couple weeks yet, so there's still time to ponder our next runDisney adventure. MOON: Haha, have you had any luck persuading Elizabeth to try one? JENN: I think she'd do a 5K if we asked her! The WDW Marathon Weekend 5K is sold out, though, so we'd definitely have to go with the Princess Half if we want to bring her along. Shall I email her? I CAN DO IT RIGHT NOW. JENN: Haha. she would love it! She can stop every ten feet and take pictures with characters! I'm totally going to email her. She can always say no! MOON: I will say that she won't need to worry about pressure. XD Princess was fun our first time! JENN: Pretty good - I got my thirty miles in, which is always a plus. I think I might buy new sneakers this week! I've been wanting to try the Brooks Ravenna 6 and I figure now's the time. MOON: Cool! Let me know how they feel. I've heard positive things about them. JENN: I will! I will also let you know about the blog roundup. - Fairytales and Fitness gets organized. - Pink Elephant on Parade changes what it means to win. - The Runner's Guide to WDW recaps the final Expedition Everest Challenge. - Theme Park Insider looks inside the mind of a cast member. - Walt Disney World for Grownups eats awesome DAK snacks. - And Pinch of Pixie Dust eats ooey gooey toffee cake and I'm jealous. - Disney With Me considers the contradictions of Mary Poppins.